That's definitely the way it felt after last night's loss. Before heading up to Fenway Park, I thought the only thing that could be worse than the last two nights was the Yankees getting no hit. I was wrong. The Yankees were absolutely humiliated last night. However, I came away a winner and in the end that's all that matters. As Marie and I stepped into the Boston team store across Yawkey Way from Fenway, we found some baseball cards. For the most part, everything was insanely overpriced. $35 for $20 blasters, $25 for $10 cereal boxes of Topps. But, they also had some loose cards that were priced, strangely, for a decent price. 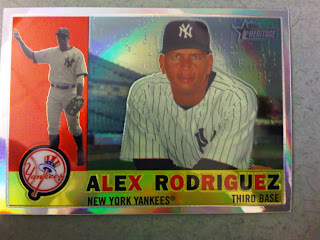 It's a 2009 Topps Heritage Chrome Refractor (73/560). For the low, low price of $1. Red Sox hate the Yankees so much that they are practically giving away these cards. Nice! man i wish i could find that price on ebay. been trying to get that card for awhile. Dave has the angle here. I would be interested to see what they would have priced any non Yankee player. - The only other card I remember in the case was a Nick Swisher (Oakland) jersey card. $5.